Jeff is the ranger at Seal Bay in South Australia’s Kangaroo Island. He loves the sea lions in his charge but the rumour around the island is that his relationship with one of the females is a lot closer than it should be. His daughter, Julie, finds her cherished anonymity at school replaced by unwelcome attention as the gossip gains momentum. She begins to compete with her father for the attention of his favourite. A sensationalist television journalist and a Japanese businesswoman provide the catalyst for Jeff to move to a sea lion colony on an isolated structure in the Southern Ocean. Here, Julie finds that she is able to remove obstacles to her wellbeing in a manner that was impossible on land. 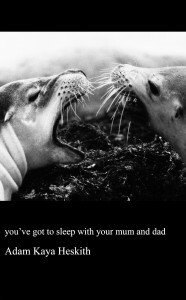 Read the first section of You’ve Got to Sleep With Your Mum and Dad. Available now on Amazon Kindle.